Dave Rave & Rick Andrew were the creative duo behind The Shakers, a wildly successful 80s power pop-a-billy roots rock outfit based in Hamilton but making waves in the UK, France, and beyond. 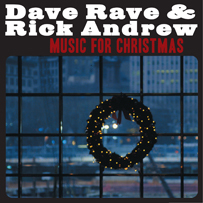 Dave & Rick are always collaborating musically and have finally collected all the special Christmas songs they've recorded over the years but only ever given to friends and family on private recordings - now they're available to all with special appearances by Lori Yates, Joe Mannix, Kate Shrock and others! Joining the duo are a great collection of local musicians. Their former Shaker co-horts Tim Gibbons and Claude DesRoches. Other special guests include Doug Feaver, Lori Yates, Jack Pedler (Teenage Head), Trickbag, and lots more.